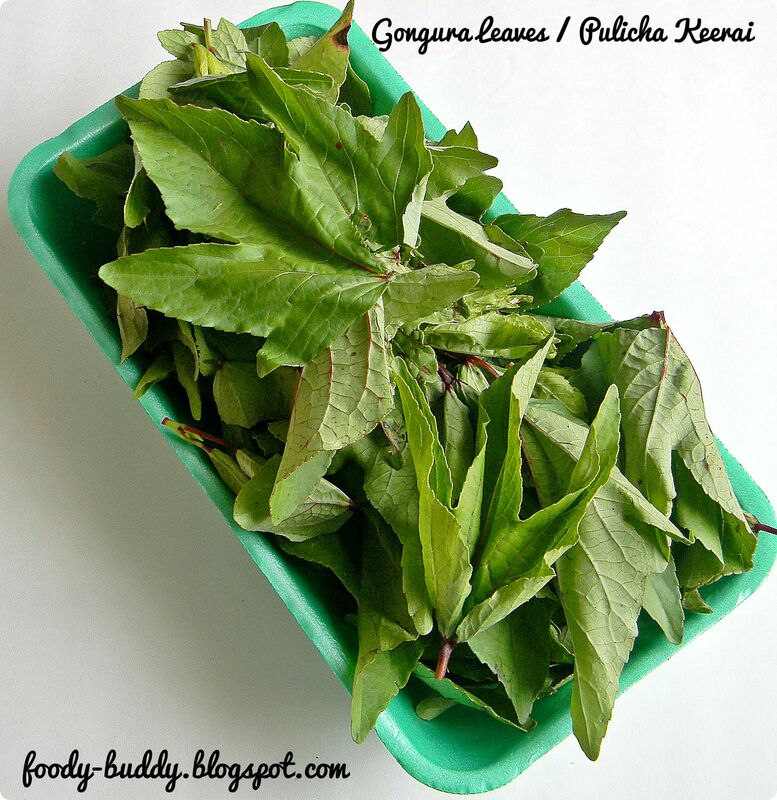 Pulicha Keerai Thuvaiyal / Gongura chutney is a popular Andhra dish. Gongura leaves are sour in taste and high in vitamins, minerals and anti-oxidants.This is my mom’s recipe.. Gongura chutney tastes great with white rice, idly and dosa. The tangyness of pulichakeerai thogaiyal compliments well with curd rice. Remove the gongura leaves from the stem, wash it in tap water and keep this aside. Heat oil in a pan and roast all the ingredients listed under ” To Saute” list, fry for 2-3 mins in a medium flame till color changes and aroma comes. Turn off the flame. Let it cool for 5 mins. In the same pan, add gongura leaves, saute this for few mins until leaves shrinks and color changes. Turn off the flame. Let them cool down for 5 mins. In a blender, add the roasted spices, grind it to a coarse powder. To the blender, now add sauted gongura leaves and salt, grind it to a smooth paste. Heat oil in a pan, when it is hot, add mustard seeds, urad dal and hing, when it splutters, add the ground paste, saute well for 2 mins and turn off the flame. Gongura chutney / pulichakeerai thugayal is ready to be served with hot white rice. Also it is excellent combination with curd rice. It stays good in refrigerator for a week. Adjust the amount of red chillies according to your taste. Adding gingelly oil increases the taste. Don’t add water while grinding. It has a excellent source of vitamin A, B9 and C.
Being rich in oxalic acid, they are not a good choice of people who suffers from rheumatism and kidney stones. Low in calories and high in anti-oxidants and fibers. It strengthens the functioning of heart and livers. This entry was posted in Budget Meals, Chutney, Side Dishes, South Indian Recipes. wow such an flavorful thuvaiyal 🙂 i love thuvayals a lot and with gongura leaves no doubt abt it must be delicious 🙂 am drooling here dear !! Healthy and flavorful chutney, looks delicious! We have the leaves over, in fact I have started growing the plant in my garden. The leaves have come out but I am waiting for the fruits to make the juice. I also cooked the leaves last week and I know how awesome the taste is. Its a perfect sour blend with be eaten with rice. That said, the next time I pluck the leaves, will try your version for the explosion of flavors. i love the bright color of the chutney..
Looks absolutely wonderful ! amazing clicks Gayathri ! it must be very delicious…lovely pictures…. one of my fav recipe….looks wonderful!! Drooling over your pulichakeerai.looks great. I love gongura dishes. But have only had them from restaurants. So nice of you to share this recipe. Bookmarked!